The earlier design effort didn’t convince many and the pattern layout now seems less suitable than the new one. Then, too, it became tiresome explaining that this old design of mine seemed much like the ideas for flags that others were promoting. So my first attempt was retired to become a personal flag. 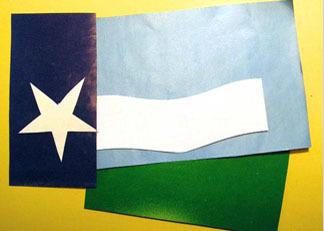 New Minnesota Flag, as a blog title, is the current proposal to change the old state flag. This new design, like the earlier one, is plainly inspired by a motto from long ago (“L’etoile du Nord”), nature’s colors (night skies, daytime skies, glades of snow, and grass), landscapes (easy slopes of a band of white,) and some contemporary slogans (like sky-blue waters and land of 10,000 lakes). We avoided dealing with political inferences (the state seal), and we acknowledged elements of vexillology only briefly. The assembling of the elements was quickly achieved following the language of the description (above). 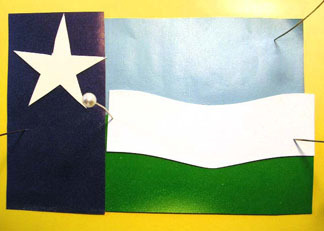 A wide, dark blue vertical bar, taking up one third of the width of the whole flag, was put in place at the hoist position, at the top of which we placed our Star of the North. 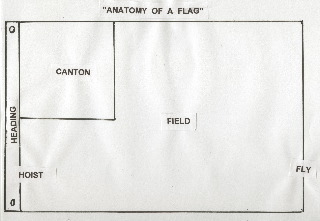 At the right, extending the remaining two thirds of the flag, we placed the horizontal bars. 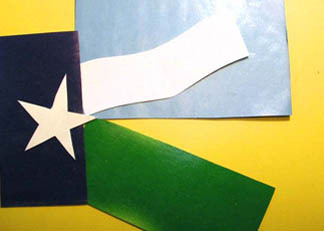 From top to bottom, these were the remaining nature colors of the design: sky blue for the natural daytime sky, then a narrower bar of white with a gentle slumping bend, and at bottom, a horizontal bar of green. The shape of the white bar strongly evokes a simple, natural landscape. “There it is,” I told him. “As basic and simple as that, no other references but pure nature, which, I feel, expresses the core essence of our state—MINNESOTA—and it’s most appropriate in a NEW flag to say so. Don’t you think? ~ by marcstratton on 12 June 2007.